A soothing gray paint replaces the tan color and a cool palette creates a luxurious, elegant, tranquil, and romantic master bedroom. 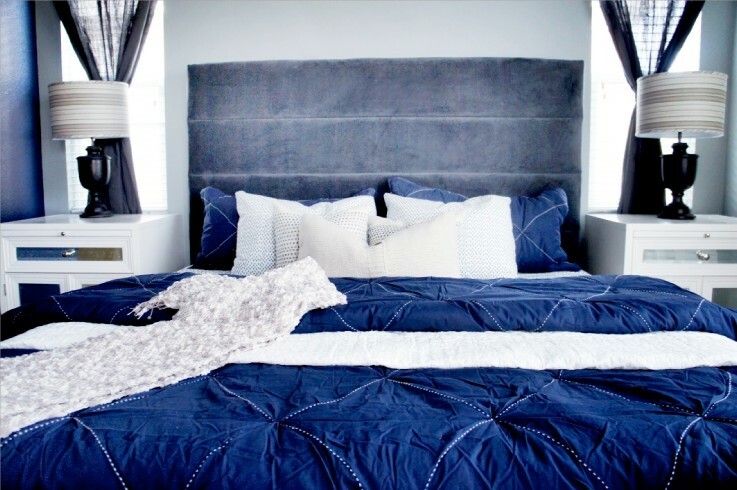 The navy blue bedding and gray upholstered headboard are a dreamy place to end the day. Gray window coverings add warmth and texture and a white chandelier gives an extra dose of elegance. The striped upholstered bench at the foot of the bed plays beautifully off of the striped shades on the urn shaped table lamps. White mirrored bedside tables complete the look. 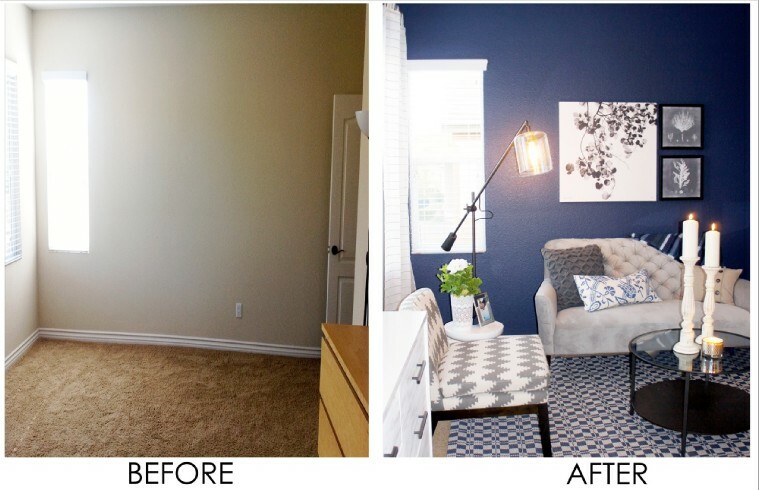 A warm gray paint was used on the walls and a large painting adds a dose of blues, greens, and turquoise to the room. A round mirror above a gray buffet balances the space and adds symmetrical harmony to a wall with awkwardly placed windows. The wood coffee table can be pulled apart and used as side tables. 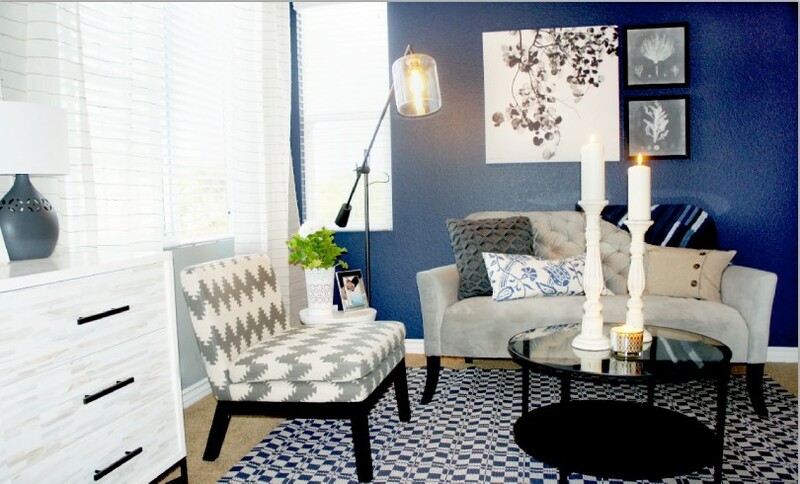 A long sofa table is the perfect height behind the l-shaped gray upholstered sofa. A soft sweater rug grounds the space and striped and floral throw pillows in cool tones tie the room together. 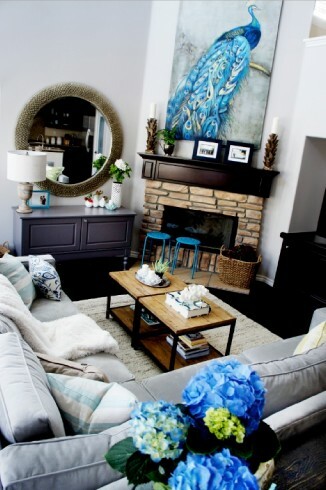 The blue stools at the fireplace provide extra seating for when the client entertains. The benches below the window are the perfect height for the low apron. 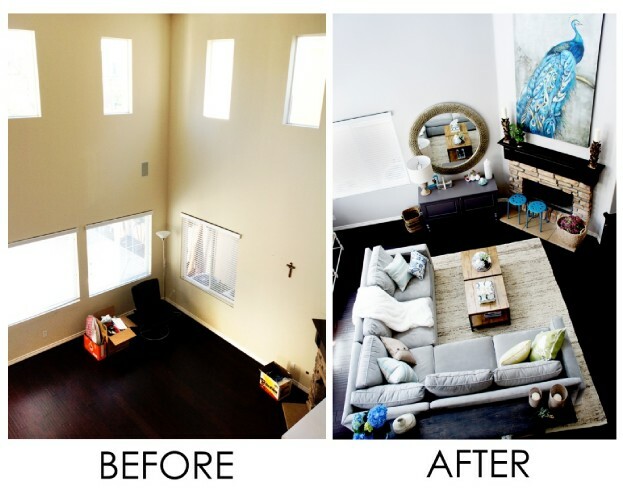 They are light and can easily be moved into the space for entertaining. A round glass table and chevron patterned slipper chair sit on a geometric black and brown rug. The dresser has inlaid details that bring in the browns and grays from the rest of the room. Sheer white curtains with brown stripes mimic the stripes on the bench and lamps. 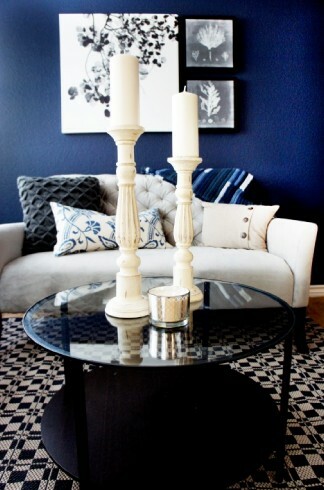 A navy blue wall is the perfect backdrop for black and white artwork. 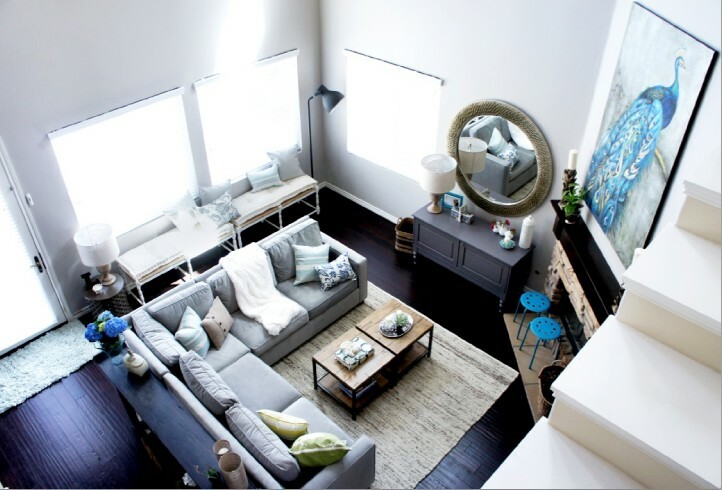 The gray sofa is a perfect place to unwind and read a book after a long day.